(and this is a conservative estimate). 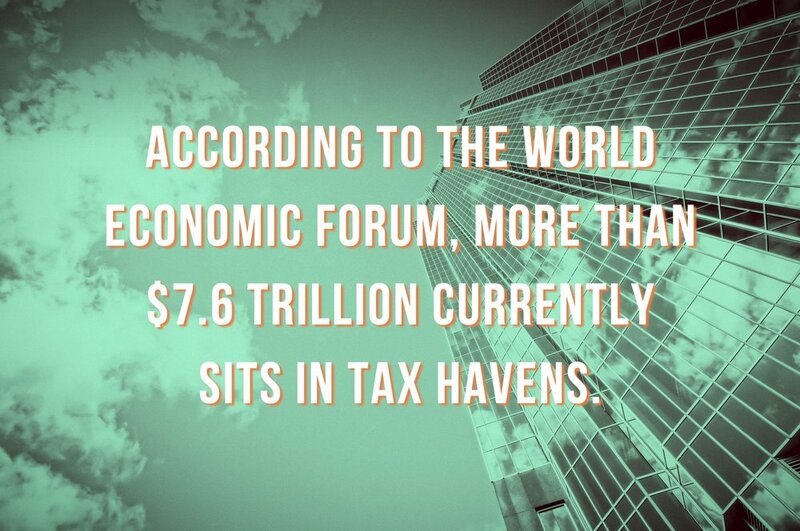 That amounts to roughly $500 billion in global annual tax loss. This is a big problem. But I wonder what this means for companies that actually pay their fair share of taxes. Shouldn’t the companies that uphold their civic duties at least get recognition? We all know that tax avoidance can severely stain an organization’s reputation. But have you considered that tax transparency and effective tax approaches can improve an organization's reputation in the eyes of stakeholders? This could be a quick win for your sustainability content marketing strategy. But before I get into the details of different ways to share your tax story, I want to examine the current climate of accountability that’s on the horizon. In the wake of the Paradise Papers, tax keeps cropping up in the news. Rutger Bergman called out billionaires at Davos for tax avoidance, making an analogy go viral: "I feel like I'm at a firefighters conference and no one is talking about water." Alexandria Ocasio-Cortez proposed a wealth tax of 70 percent, a bold move supported by Nobel Prize winning economist Paul Krugman in the New York Times. As a result, nearly everyone's mind is on taxes. Tax loopholes and corporate tax bargaining with local governments can leave communities and institutions that rely on tax-based funding either just scraping by or bankrupt. International in scope, this issue implicates corporations and governmental actors alike. It seems that even if reforms are pushed through, international businesses may start to shop around for better tax rates in distant jurisdictions. Or, using another popular strategy, they may hide their assets behind layers of shell companies. To counteract these unsavory tax evasion strategies, the movers and shakers of social responsibility are releasing standards to urge organizations to show their true tax colors. Such standards are designed to create a greater climate of accountability in which businesses compete for positive recognition. Recently, two major standards have laid the groundwork for making tax part of a company’s corporate social responsibility profile. In February of 2018, the B Team published a set of responsible tax principles entitled “A New Bar for Responsible Tax.” The principles were developed in collaboration with civil society, international organizations, institutional investment firms and corporations including Allianz, BHP, A.P. Moller - Maersk, Natura Cosméticos, Repsol, Royal Dutch Shell Plc, Safaricom, Unilever and Vodafone Group Plc. B Team presents these standards as a means to align business practice with the UN 2030 Sustainable Development Goals. In doing so, it acknowledges the importance of tax for redistributing wealth, forming bonds between civil society and government, enabling ease of international investment and discouraging bad environmental activities. The standards emphasize clear leadership for tax management by assigning this responsibility to the Board of Directors. They assert the importance of lawful tax management that adheres to particular localities where economic activities take place to prevent businesses from “shopping around” or using empty shell structures to minimize exposure of existing assets to tax. The standards point out the strong need for dialogue between government and corporations to ensure tax payments support tax systems that actually work and to prevent corporations from undermining the social benefits brought by taxes. Finally, transparency is included as a means for civil society to constructively critique a corporation’s tax policies. These standards ask corporations to take a proactive role in shaping their tax approach by specifically linking it to sustainability. Assurances that the tax approach will be followed and analysis of risks are embedded into the reporting process. Corporations are called on report on the approach they’ll take for collecting stakeholder feedback. In addition, corporations specify the entities that they own and their local jurisdictions and brief financial statements for each, including clearly disclosed tax incentives. GRI’s standards would make tax evasion easier to discern and available for comment by stakeholders. Do you actively engage the tax authorities in your local community to work towards constructive local tax-funded programs? Tell your stakeholders about it in a report that outlines the civil society issues you have supported. Do you have an impeccable standing in terms of your tax transparency or compliance? Maybe you’d like to share the percentage of your income that has actually contributed to the local community over time. Make some infographics and underscore your tax approach in a content marketing campaign to put corporate tax responsibility on the map. Has your business turned down attractive opportunities to move its headquarters in favor of supporting your community and improving long-term stability in its region? Use this information to create a timely social media campaign or newsletter just in time for tax season. Does your business operate according to a particular set of tax beliefs or commitments that your stakeholders should know about? Introduce this through a series of videos or blog posts. Show your stakeholders that you value their insights about tax responsibility by creating a survey that sparks discussion and debate. Use this to share your findings and refine your own tax approach and include it in your mission statement. While tax may not seem like the most glamorous way to highlight your “doing good” story, its an issue that really hits close to home for many people. In the U.S., we’ve watched tax-funded programs slide out of existence and not just due to corporate tax evasion, but tax policy from government as well. It has created a generational divide that’s not in favor of younger people. Gone are the days of guaranteed social security or wages that matched the rate of inflation. And the consequences of not having tax-funded safety nets are deeply felt throughout the U.S. That's why the issue of tax resonates with so many audiences. The beauty of purpose-driven marketing is that you can proudly wear your colors when you’re making sustainable decisions. In the case of responsible tax management and approaches, you may be surprised to find an apt audience for your positive performance.